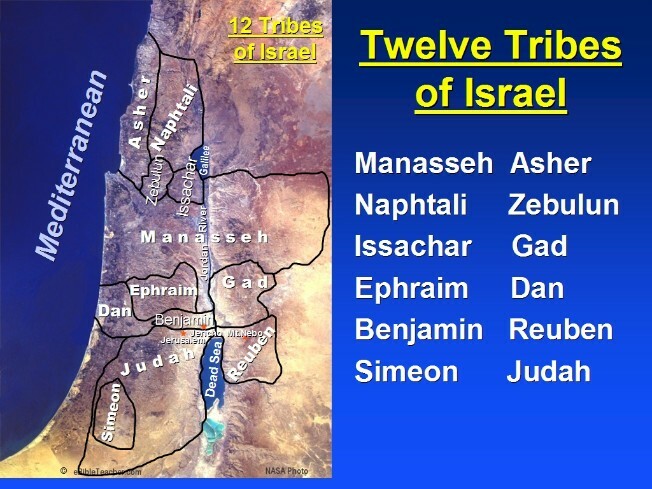 TRIBES, THE TWELVE, the traditional division of Israel into 12 tribes: Reuben, Simeon (Levi), Judah, Issachar, Zebulun, Benjamin, Dan, Naphtali, Gad, Asher, Ephraim, and Manasseh. Biblical tradition holds that the 12 tribes of Israel are descended from the sons and grandsons of Jacob (Gen. 29–30; 35:16–18; 48:5–6). The tribes are collectively called Israel because of their origin in the patriarch Jacob-Israel. Jacob and his family went into Egypt as "70 souls" (Ex. 1:1–5). In Egypt "the Israelites were fertile and prolific; they multiplied and increased very greatly" (1:7), and there they became the "Israelite<?XML:NAMESPACE PREFIX = GALE /> people" (1:9). A pharaoh, "who did not know Joseph" (1:8), oppressed them by burdensome labor. God "remembered His covenant with Abraham, with Isaac, and with Jacob" (2:24), made Himself known to Moses (Ex. 3), and rescued the Israelites from Egypt. By this time the nation numbered "600,000 men on foot, aside from taf" which apparently means women as well as children (12:37). At Sinai, the nation received its laws and regulations, covenanting itself to God (Ex. 19–24). After wandering for 40 years in the desert under the leadership of Moses, the 12 Israelite tribes penetrated the land of Canaan with Joshua in command. The united force of the 12 tribes was sufficient to conquer the land, which was then distributed among them. During this period of settlement, and the subsequent period of the Judges, there was no predetermined pattern of leadership among the tribes, except for deliverer-judges sent to them by God in time of need (see also *Judges, Book of). Such crises forced the tribes into cooperative action against enemies under the leadership of the "deliverer." *Shiloh served as a sacral center for all the tribes, housing the Ark of the Covenant under the priestly family of Eli (I Sam. 1:3, 12; 2:27). Under the impact of military pressures, the Israelites felt compelled to turn to *Samuel with the request that he establish a monarchy, and *Saul was crowned to rule over all the tribes of Israel (I Sam. 11:15). Upon his death, *Ish-Bosheth, Saul's son, was accepted by all the tribes save Judah and Simeon who preferred David. David's struggle with the house of Saul ended in victory for him, and all the elders turned to David for royal leadership. He ruled from Jerusalem over all the tribes of Israel (II Sam. 5:3), and was succeeded by his son. After the death of *Solomon, the tribes once again split along territorial and political lines, with Judah and Benjamin in the south loyal to the Davidic house, and the rest of the tribes in the north ruled by a succession of dynasties. Each of the 12 tribes enjoyed a good deal of autonomy, ordering its own affairs after the patriarchal-tribal pattern. No doubt there were administrative institutions common to all the tribes, situated beside the central shrines, though information about them is exceedingly scanty. During the desert wanderings, leadership of the people was vested in the princes of each of the tribes and the elders who assisted Moses. They met and legislated for the entire people (Ex. 19:7; 24:1, 9; Num. 1–2; 11:16–24; 32:2; 34:16–29; Deut. 27:1; 31:28). There are references to meetings of tribal leaders and elders during the periods of the settlement and the Judges. "The princes of the congregation, the heads of the thousands of Israel" along with Phinehas the priest, conducted negotiations with the Transjordanian tribes, in the name of the entire nation (Josh. 22:30). Joshua summoned "the elders, the heads, the judges, and the officers of Israel" to make a covenant in Shechem (Josh. 24). The elders of Israel, speaking for the entire nation, requested Samuel to appoint a king (I Sam. 8:4). The incidents of the concubine in Gibeah (Judg. 19–21) and Saul's battle with Nahash the Ammonite (I Sam. 11) are classic examples of joint action taken by the league of 12 tribes acting "as one man, from Dan even to Beer-Sheba, with the land of Gilead" (Judg. 20:1; I Sam. 11:7). In the one case, unified action was taken by the tribes against one of their members, Benjamin, for a breach of the terms of the covenant (Judg. 20:7). The war against Nahash the Ammonite proves that the tribes were required to come to the aid of any one of the league that found itself in difficulty. Because of the sacral nature of the league, the wars of the tribes were considered "wars of the Lord" (Ex. 17:16; Num. 21:14). Nevertheless, the narratives in the Book of Judges regarding the battles which Israel waged against its enemies make it clear that the league must have been rather weak in those days. The consciousness of national and religious unity had not yet led to a solid politico-military confederation. The Song of Deborah gives clear expression to the lack of solidarity among the tribes, for some of them did not come to the aid of the Galilean tribes. It is impossible to designate even one war against external enemies during the period of the Judges in which all the tribes acted in concert. Indeed, there are indications of intertribal quarrels and disputes (Judge 7–8; 12). In this connection, there are scholars who hold that the judge-deliverers were not pantribal national leaders, but headed only individual tribes, or groups of them (see *Judges). It was only toward the end of the period of the Judges when the Philistine pressure on the Israelite tribes increased in the west and that of the Transjordanian peoples in the east, that the religionational tribal confederation assumed political and military dimensions. The Israelite tribes then consolidated as a crystallized national-territorial entity within the framework of a monarchical regime. David, Solomon, and afterward the kings of Israel and Judah tended to weaken tribal consciousness in favor of the territorial and monarchical organization. It is apparent, however, from Ezekiel's eschatological vision (Ezek. 47–48) that the awareness of Israel as a people composed of 12 tribes had not, even then, become effaced.